A relay typically involves a component called an inductor, which generates a magnetic field when current is passed through its coils. This inductor is placed close to an iron lever, so that when the inductor generates a magnetic field, the iron lever is attracted to the inductor. On the opposite end of the lever are two contacts of a different circuit. When the lever moves towards the inductor, those contacts are joined, completing the other circuit. You can test a relay's resistance with a basic multimeter. The various contacts of the relay should be labeled according to their function. The COM contact stands for "common," or ground. Two other typical contacts are the "normally open" and "normally closed" contacts. These are usually represented as "NO" and "NC," and refer to the path the current takes in the different states of the relay's functioning. Some relays have more contacts, depending on their intended function. A relay is typically enclosed in a plastic compartment with various contact points for the switching networks. To access the internal components, remove the covering of the relay to expose the inductor and other components. The inductor looks like a coil of wire. To properly diagnose a relay, you must know what resistance values are acceptable for the various components and contact points in the relay network. In general, resistance for a given connection should be fairly low or fairly high, depending on the nature of the connection. However, in order to determine the precise correct values, you must consult the component data sheet that normally comes with the relay when you purchase it. If your relay did not come with a data sheet or you did not buy it new, go online to look up the relay data by part number (see Resources). Test the inductor by connecting the leads from your multimeter to the two ends of the inductor. 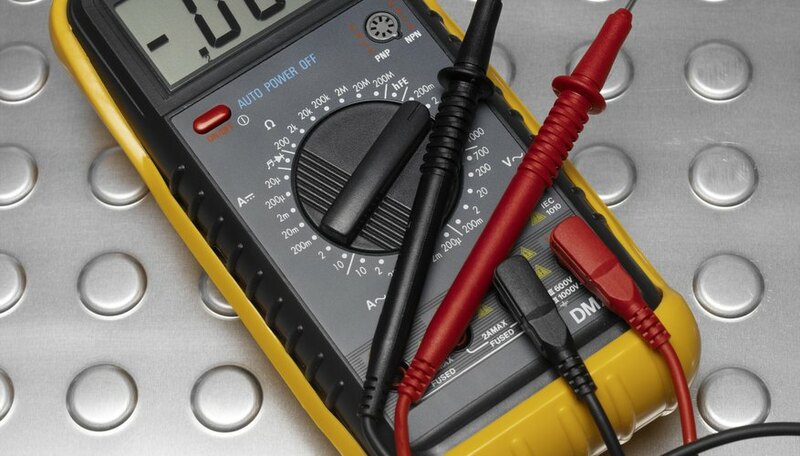 Make sure your multimeter is turned to a setting that detects ohms, the measurement of resistance. Furthermore, make sure you are using a scale appropriate for the expected values. For example, if the expected resistance is greater than 1,000 ohms, do not use a 100-ohm scale on your device. When you connect the leads of your meter to the terminals of the inductor, the order does not matter. Depending on the type of relay you are testing, the switch may be Double Throw. This means that both the closed and open positions of the switch correspond to different completed circuits. Apply the two leads of your multimeter to the two contact points that complete the normally closed relay circuit. Again, the polarity does not matter. Because these contact points complete the relay circuit, resistance should be low. If your multimeter reads close to zero ohms, this aspect of your relay is functioning properly. Go on to connect your multimeter leads to complete the normally open portion of the circuit. The resistance between these two point should be very high when the relay is not engaged. GCSE Science: How Does a Relay Work?